Poet and playwright Shailja Patel. This week we feature Asha Kowtal, an Indian organizer who is raising the voices of Dalit women across India and around the world. Dalit, or broken people, are on the bottom of India’s caste system and face brutal discrimination. Asha Kowtal will be speaking at UC Berkeley on April 19. We also talk with Shailja Patel, a poet and playwright and author of Migritude, a book which weaves together family history, colonization, and love. Migritude is the portrait of a woman in the boot print of Empire. 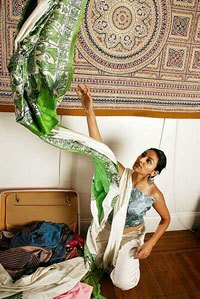 Shailja Patel will be performing at Kaya Press’s 20th anniversary party at City Lights in San Francisco on April 17th. APEX Express is a weekly magazine-style radio show featuring the voices and stories of Asians and Pacific Islanders from all corners of our community. The show is produced by a collective of media makers, djs, and activists and airs each week on KPFA 94.1FM. APEX Express is committed to building a broader social movement for justice and collective liberation for all oppressed people, including poor & working-class people, people of color, women and queer people. We support grassroots organizing and cultural work that advance these goals, and see APEX as a space for building consciousness and promoting critical discussion about these efforts. Like what you hear? Show your support for independent community media that is free and accessible to everyone by sharing this broadcast of ideas, news, and views with your network of thinkers & doers.